Bashing balls away from out of one of The Belfry's swanky custom fitting bays, waiting patiently for my allocated instruction slot with PGA National Academy coach Ben Frost, I could not help but be drawn to something in the corner of my eye. And no, it wasn't the cute looking blonde that had just driven into the car park. "Oh I'm glad you noticed that Andy, it's a brand new product called the FatPlate," said my host for the day in PGA National Academy senior coach Ben Frost. 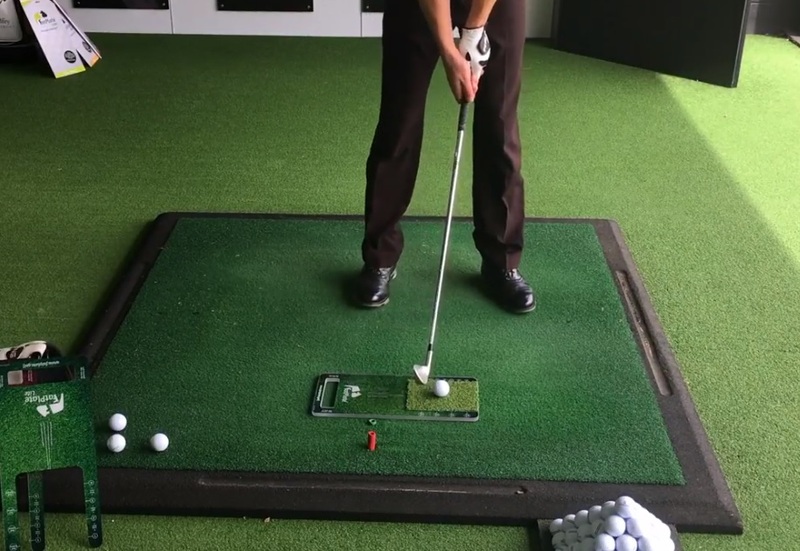 "It focuses on muscle memory by allowing you to continually strike the ball off a synthetic turf strike-zone, so it helps you compress the golf ball better." The idea came about by a graphic designer by the name of Adam, a 15-handicapper who had just received a lesson. "The guy who designed it was having a lesson one day and someone said to him if you want to strike the ball well then you need to get the low point after the ball, so put a towel or a fitting board behind some three or four inches. "The idea is that this encourages you to improve your weight shift over to the left, so you're turning the body ahead of the hands and so the hands are leading the clubhead. When you get to impact your hands are forward, the club is still moving down and you will strike the ball cleanly. "So he obviously went away and thought, 'I'll make that!'" He made it look good as that what he does and it's his job, and so here we are and we're now live." There are four different types of FatPlate - the standard FatPlate (also available in a Lady's version), FatPlate Shank, FatPlate Lite and FatPlate Sand - but each has the basic concept of do not hit behind the ball! Having tested it for myself, you will certainly hear a thud on the board if you do hit well before the ball and you'll feel it slightly in your hands - so it makes you not want to do it again! The best thing about it is that it offers you fantastic feedback that you would not typically get on a normal practice range. It's a self-training aid that allows you to hone your swing at your own pace. You'll quickly feel what should be normal, especially if you're prone to the odd fat or shank. The FatPlate Shank is a great little tool, especially given you've got a narrower piece of turf to strike from. I also like how you can take the FatPlate with you and use it wherever you want. Whether you're an amateur or a Tour Pro, each of the FatPlate designs are an essential tool for every type of golfer. It works for high-to-mid handicappers looking to create a perfect strike, but equally for low handicappers and professionals looking to maintain a perfect strike. To take things to the next level, you can also include StrikeStrips into your practice. In addition to the auditory response given by the FatPlate, StrikeStrips offer a visual reference to not only your point of contact but also offer swing path feedback. 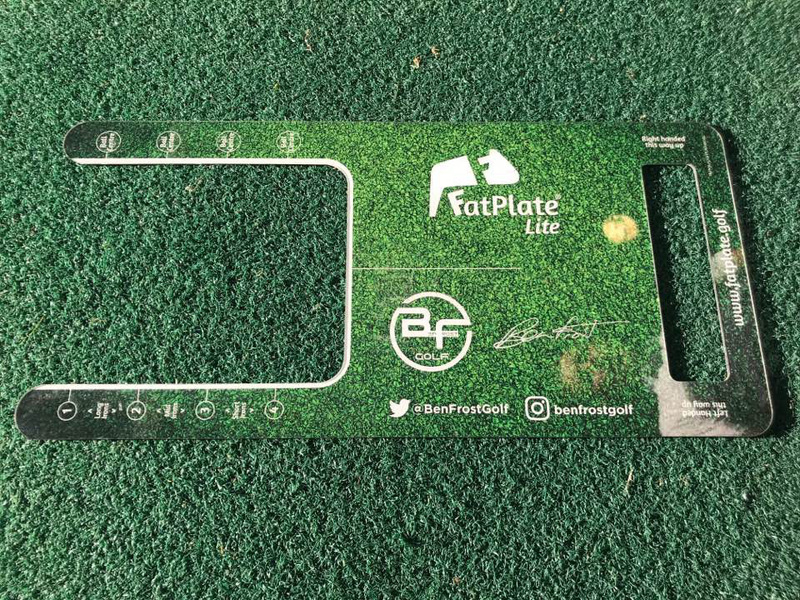 FatPlate is not just turning heads with European Tour professionals, coaches and amateur golfers in the United Kingdom, but it's beginning to reach new ground in the United States and Japan with an influx of orders being placed on the FatPlate website in recent weeks. "Even Trump has shown interest in the FatPlate," said Ben. "It's early days but the product is proving all the rage and we're delighted with how it's being received around the world right now. Long may it continue." Following the initial success of FatPlate, a number of new designs and additions will be forthcoming such as FatPlate Driver and FatPlate PuttPlate - so keep checking back on the FatPlate website for those. FatPlate prices range from £30 to £65; visit the FatPlate website for more information and to purchase one. Check out more from Ben Frost on his regularly updated and incredibly insightful Instagram page.